Despite almost drowning here the first time I ever came, Noosa Heads is possibly my favourite beach area in Australia (except maybe Cottosloe beach in Perth). The rainforest comes all the way down to the sea and kisses the water. You can watch bush turkeys scratch around in the scrub when you lie on the beach or look up and see a koala! If you take a walk around the beaches you wind around cute forest trails and beautiful architectural houses. 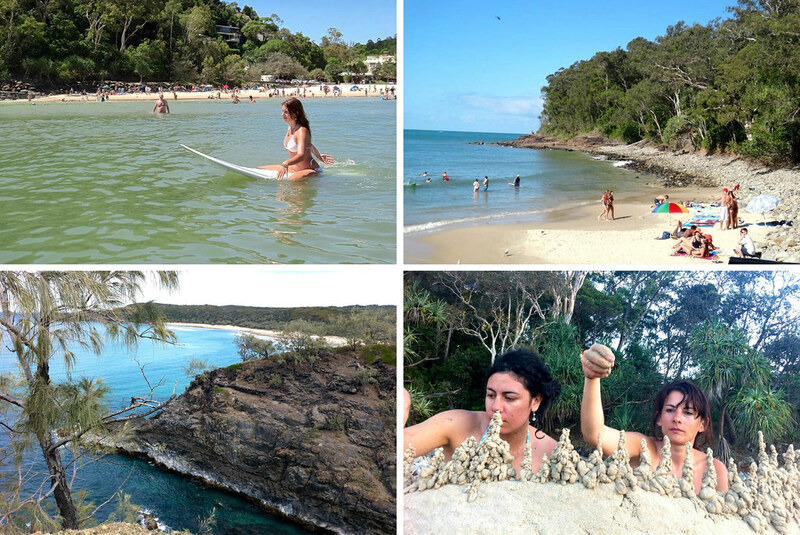 Hostel: Halse Lodge at Noosa Heads is a memorable place to stay in Noosa. It’s one of the only hostels that are a short walk away from the beach and it’s nestled in amongst the rainforest. The 16 bed dorm comes out over a cliff into the rainforest canopy and overlooks a small stream. It has an entire wrap-around balcony with lounges and is one of the nicest places I’ve stayed in Australia. Halse Lodge has free surf board hire, table tennis and pool table and is about a 1 minute walk from the main beach. Dorm rooms are from around $30 a night. 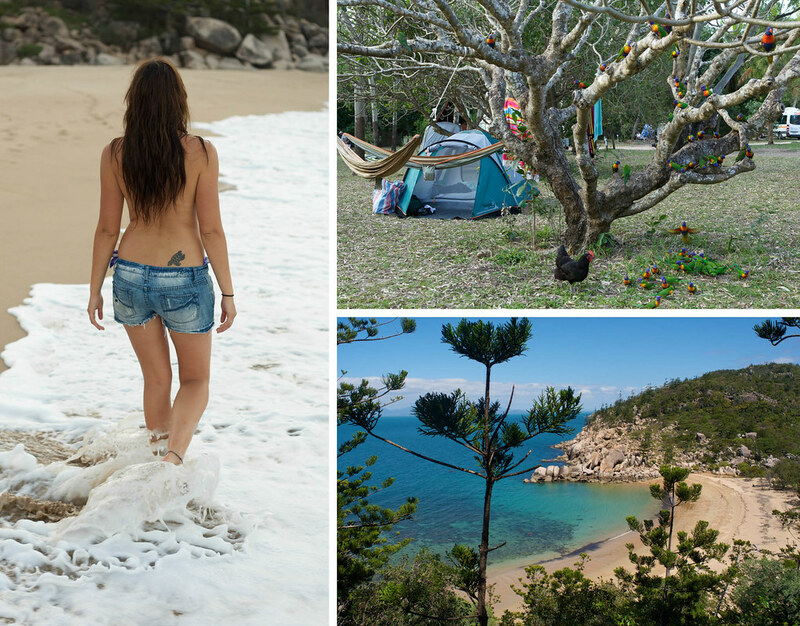 If you are on much more of a budget, a friend said she has seen people sleeping on the beaches around Noosa in sleeping bags (one couple even had a sand coloured sleeping bag), so that’s also an option. Food: I would suggest buying some BBQ stuff and heading to Noosa National Park for a BBQ amongst the koalas and bush turkeys. Drink: There’s really only one place to drink there other than at your hostel bar; at the Surf Life Saving Club. I can’t comment on price because I’ve never actually drunk there. I’ve preferred to stick to sneaking drinks into the hostel rooms or drinking in the parks. Other: When you go through Noosaville go to Coles so you don’t have to go back later. There isn’t really any supermarkets in Noosa Heads and it would be a huge inconvenience if you didn’t have a car. Otherwise everything else is pretty much free. There are trails and national parks, markets and beaches. It’s small but has the ultimate in beautiful surrounds and views. Favourite things to do: The beach I nearly drowned at is actually my favourite; it is one beach South of main called Little Cove. It’s a short walk along the sidewalk trail so it’s usually pretty secluded. It’s actually not dangerous; when I went there I went straight in the water adorned with brand new shiny snorkelling gear, without even checking the current, and was pushed under by forceful waves. Thankfully I was dragged out by my uncle and pushed onto a wave into the rocks. I managed to survive with a few scraped knees and hands. Anyway! Another cool thing to do is the walk from Noosa National Park around the heads. You are almost guaranteed to see a koala and the change in scenery from rainforest to harsh headland is really beautiful. It’s also Free! There’s really nothing in between these two places except for Bundaberg which is only really good in the turtle laying/hatching season. So I would just skip it. Rockhampton wasn’t great either. We just stopped there for a steak at the country pub. But we actually slept on the side of the road in a camper van stop because we weren’t staying for long. You can easily stay in any of the campervan rest stops for the night, although it’s apparently illegal if you’re in a car because they don’t have shower facilities. We were in a car with a tent so we just pitched a tent on the grass near the toilet late one night and left again quite early the next day. We did this several times in different places without any problems. Food: Rockhampton is famous for its steaks. A majority of the Australian beef farms are based in this area so you know you’re getting good and fresh steak. Anywhere that sells local beef is going to be good. Mackay is another place that you don’t really need to stop at. We did because my cousin lives there but you could easily skip it and not miss out on too much. Having said that, though, the harbour is beautiful and would be a great place for a meal. It is also referred to as the sugar cane capital of Australia, so if you were to leave and move inland you would come across some spectacular farmland before hitting the hinterland. Airlie beach was choc-a-block full of backpackers. I think it was because it was a place of transit with people heading off to the Whitsundays and others off North to Townsville. The place had a cool, laid back, hippy vibe and a beach with sun scorched travellers all over it. It is very condensed with everything happening on the one main road, so a very easy place to meet people and make friends. Hostel: I can’t recommend anything because I didn’t stay at a hostel here. But I heard Nomads has a beach volleyball court and a poolside bar so that would sell it for me! Beds are from about $28 for 6 share dorm. Food and Drink: We had an awesome $10 pub meal and cheap drinks at Paddys Shenanigans Irish Bar. The place had a huge outside deck to drink on and did really cheap backpacker special meals and drinks. This would have to have been my most favourite part of the trip. After hearing about it from my uncle that it was the “cheap version of Hamilton Island” I couldn’t get it out of my head that it was going to be touristy and commercial. I was thankfully wrong. South Molle Island is beautiful National Park and unless you are staying in the only resort on the island then you have to camp. It’s camping for the thick in skin though; there are no showers and only a pit toilet. There’s no where to get food or drink here so you have to bring everything over yourself. You also aren’t allowed fires, only contained camping stoves. This is my type of camping! Close by to our campsite there was an abandoned resort. The eeriness and wonderment of this place is hard to describe. I went there twice just walking around the overgrown tennis courts, rooms with spiders and plants growing in through the windows and the eerie shop fronts still full merchandise. We were sleeping with the sound of water lapping on sand all night and woke each morning to views of the green water. It’s hard to contain my excitement about how cool this island is, so I have written another article just on South Molle Island here. The first place I stayed where I didn’t pay ANYTHING while I was there. Hostel: No Hostels here, only camping. Because it’s national park they charge a $5.40 camping fee per night (nothing, really!) and you have a pick between 2 ends of the island Sandy Bay and Paddle Bay. We chose Paddle Bay because it was close to North Molle Island and I was interested in swimming across to that island. Turns out it was a great choice because it was sheltered from the wind and had much better views, it was more accessible and was closer to the abandoned resort. Food: Bring your own. You can only take contained camping stoves on the island so you’re probably up for a steak and bread. We didn’t bother with an esky, instead opting for raw fruit, BBQ’d veg and meat and boiled 2 min noodles. Other: The most expensive part of this trip is going to be the boat over. It was $65 each for the return trip on the boat. But we figured that we would be on an island camping and we would probably pay that much for a hostel anyway. If you can find your own way over (kayak, jet ski) then it would only cost you the national park fee. Favourite things to do: Everything! 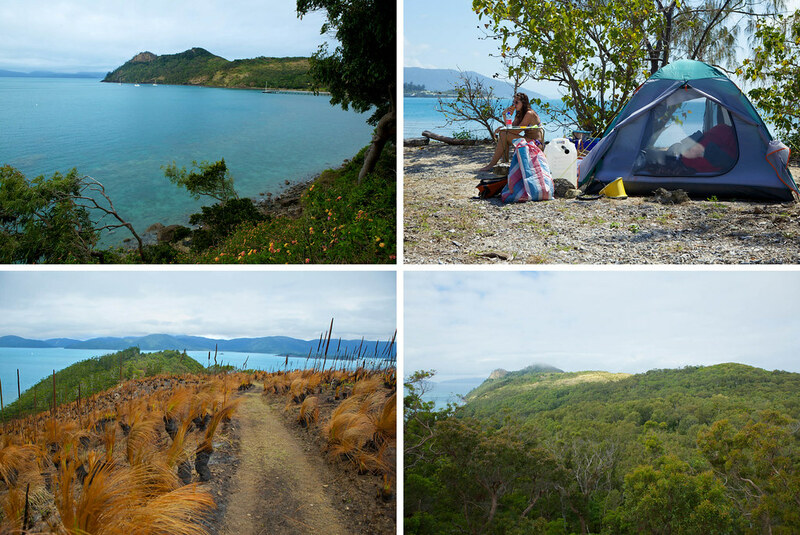 Every single thing I did on South Molle Island was my favourite, and didn’t cost a cent! We did a walk from our campsite to the opposite end of the island; it was hot but beautiful. It went from bush, to scrub land, to beach and back with great views in between. We explored the abandoned resort, taking photos and swimming in their pool. We walked across the sand bar that became exposed at low tide to North Molle island and went snorkelling and we laid in our hammocks stretched between trees right next to our tent, reading and watching jet skis whiz past. Due to our time constraints I didn’t get to stay in Townsville for as long as I’d have liked. It was a really nice place with a great vibe and an amazing esplanade stretching along the many beaches that you could actually swim in! The esplanade was full of grass, parks, BBQs, tables and Cafes, then every now and then it cascaded into a sandy beach. I spent most of my time here sleeping on the beach nursing my hangover from the night before. Hostel: We stayed in a plain but cheap hostel that was close to the centre of the city called Civic Guest House. The people staying there were overly friendly and keen for a drink. Everyone congregated in the big table outside, playing card games and sharing toxic drinks until it was time to go out. This was possibly the friendliest hostel of the trip, although I’m not sure all of the people who hung out there actually stayed there. Dorms are from $30 a night. Another place with great reviews is Rambutan from $30 pn. Drink: A crazy bar/nightclub called Molly Malones Irish Bar seems to be where all the backpackers go, and the rest of the town. Drinks were cheap; spirits $5. Other: The esplanade is free and was a great place to chill and relax, with a mix of park lands, beach and walkways. There is also good diving, sightseeing, museums, wetland parks and botanical gardens. 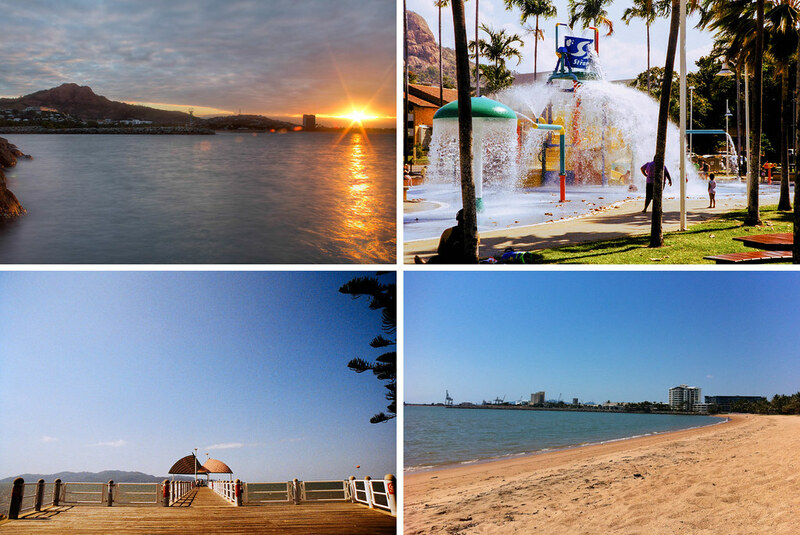 Magnetic Island is picturesque, fun, huge and adventurous with so much to do! I highly recommend that you make the effort to see this place. Despite that it’s hard to get around with the island bus only coming every half an hour, it’s definitely worth the effort. If you’re into hikes, scenery, beaches, koalas and other wild Australian animals then you are going to have a great time here. We got so many great photos from here that we put together a Photoblog. Hostel: There are two choices of hostel here, Base the party hostel on one end of the island and Bungalow Bay YHA at the other end. Base is cheap (around $15 a bed) and hosts the famous full moon party each full moon. We stayed at the YHA because they were doing a camping special (2 nights, 2 people camping with free entry into their wildlife park for $77). Their camp area was great; big and shady with chickens, curlews and lorikeets. In my opinion we had the best setup going with our tent and hammocks hung from a frangipani tree that was also the hang-out spot for lorikeets in the afternoons. There was a large pool, bungalows, hammocks, a bar and a short walk away was horseshoe bay. Food: The hostel had a huge comprehensive kitchen which is where we cooked most of our food. We did indulge in a couple of the bar meals where they had specials on most nights. Drink: The hostel bar was the only place to drink on that end of the island other than the Bowling Club which was a bus ride away anyway. One of the nights we were there we played giant Jenga which I managed to win and get myself a couple of free jugs of beer. If you’ve no hope of winning a bar game then drinks are still fairly priced as long as you like beer. Other: You can hire jet skis at Horseshoe bay without needing a license. It’s expensive though at $95 for 30 mins. There are also Kayaks to hire at $30 for 2 hours. The YHA has an on-site nature park where you get a guided tour; and can hold koalas, crocodiles, cockatoos and lizards and pat a wombat for $19. Free things to do include walking around the many trails on the island, going to one of the many beaches, snorkelling at Arthur Beach, go sightseeing or you can use the electric scooters at the hostel for Free. Favourite things to do: I loved Balding Bay nudist beach. Not just because you could strip down to nothing and go swimming but also because it was one of the prettiest beaches on the island. The huge boulders surrounding the beach had pine trees growing out of them and the rocks created spectacular colourings. It’s about a 15-minute walk from the hostel but is totally worth it. Snorkelling at Arthur Bay was also amazing. It’s thus far been some of the best off-beach snorkelling I’ve ever done. The reef is beautiful and there are fish everywhere. There were only a couple of other people on the beach too so we had the reef to ourselves. As we were leaving a whale and her calf swam past the beach. If I’d have still been in the water I could have easily swam over to them. The only bad thing about this place is how difficult it is to get to. The bus only goes every hour or so and drops you off at the side of the road where you then have to walk for 20 minutes to find the entrance of the beach, try not to get lost because it’s really easy to do! At 4pm every day at the hostel they put out a tub of wet bread which attracts hundreds of lorikeets. If you are game you hold the bread and wait for the birds to come and sit on you and munch on the bread. Sometimes you can have up to 10 birds at a time fighting over the bread on your hands. Mission beach stretches for miles and is famous as being a popular beach to skydive onto. I was literally only here for a morning but what I saw of the place, I would have loved to stay longer. All over the beach were thousands of tiny balls of sand where the crabs have rolled them up when making their holes. The bay is calm with the crystal clear water lapping at the white sand and the palm trees hiding away the resorts and houses. If you have the time, definitely stay here for a few days. Finally I have arrived at a place I’ve been wanting to go for a long time. I’d heard about the year-round perfect weather and relaxed lifestyle they have here and I wanted to see it for myself. But most of all I wanted to see the Great Barrier Reef! If you haven’t noticed I love the ocean and I was shamed to think that I’d never seen the biggest reef in my own country. 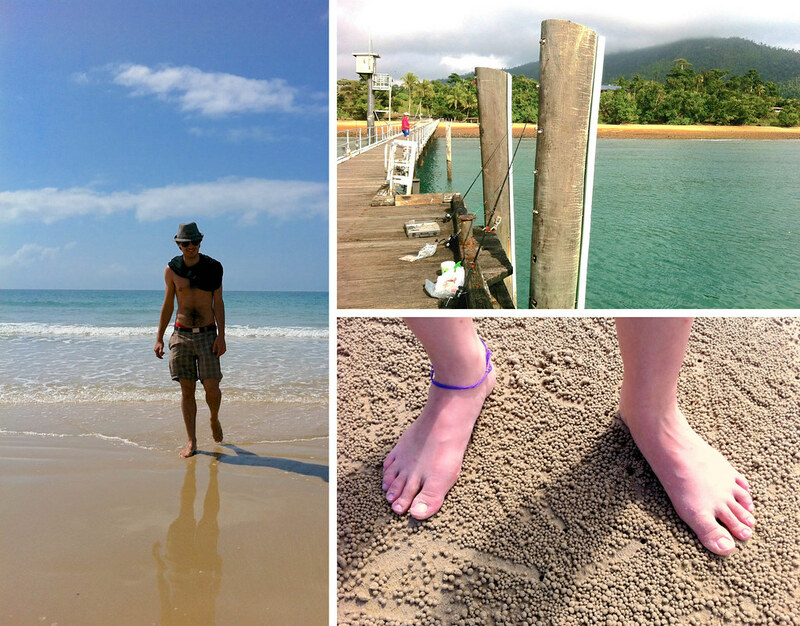 Cairns was everything I wanted it to be, and more! It was hot, so, so hot; an average of 32 degrees celsius every day that we were there (in Winter!). Heat stricken people doing things at all times of day, backpackers lounged near the lagoon, boats left for the reef daily, people drinking, markets and great seafood. Most of my time spend here was by the lagoon, in the lagoon, walking on the esplanade or drinking in a trendy bar. Hostel: Although we had a friend living here that we stayed with, we did stay at Gilligans for the Saturday night under a friends recommendation. The best way I can describe this place is that it’s like a backpacker factory. It’s huge, all the rooms are identical and there are so many rules that I felt a little uncomfortable. It definitely didn’t have the same relaxed, carefree feel that the city did. I did have lots of fun there but it was difficult to make friends because you weren’t allowed to drink in your rooms or in the kitchen area. The only place to enjoy a beverage was at the bar where the drinks were expensive and, to me, bars aren’t the most social of places, especially when the music is blaring. Gilligans does have a pool that you can buy a drink in the bar next door and head to with your drink, which is pretty cool. Plus it is on top of the Farmers Markets where there were loads of fresh produce and food, all of it cheap and delicious. Gilligans was one of the the cheaper places at $18 a night with a free meal, free gym, free parking and the cool bar-side pool. Food: The freshest and most delicious place to eat was at Rustys Farmers Markets where they prepared all the food fresh. It was a great price too. Dishes around $7. 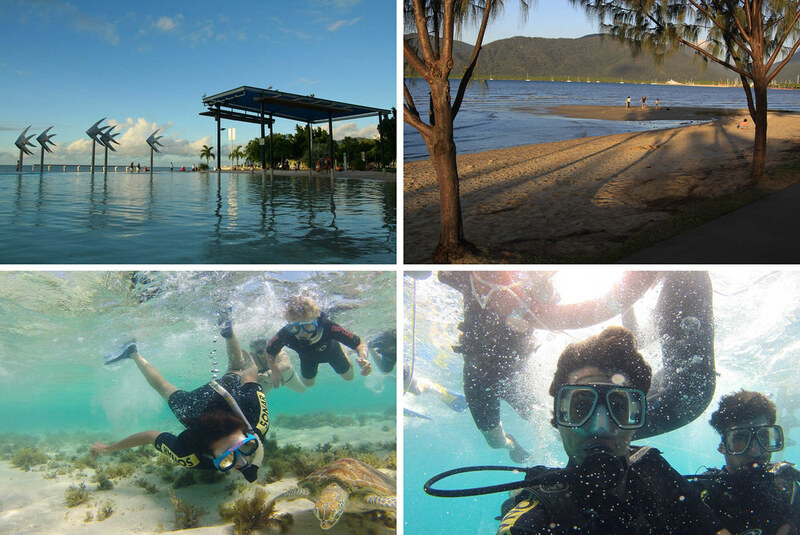 Other: With weather so perfect, there are loads of things to do around Cairns, and lots of them free. They have events on at the esplanade every second day. Volleyball courts, the man-made lagoon (you know, because of the crocodiles), festivals and markets are some of the Free things to do here. But the best thing to do is to take a snorkelling/diving tour out on the reef. This is a bit expensive but totally worth it. The whole day cost us $160 each with Ocean Freedom for the dive and snorkel or $145 for just the snorkel with tour guides, equipment and lunch included. We booked through Peterpans and got a bit of a discount. Favourite things to do: Sunbake or read on the sand or grass next to the lagoon, and go for a swim when you get hot. As the afternoon comes about go to one of the many outdoor bars and enjoy the sunset. Wander around looking at the sites and checking out food places. Drive to one of the beaches close by, have a BBQ and check out what’s around. Most of the beaches you can swim at in winter. A great day trip from Cairns is Kuranda, a village town nestled in the rainforest mountains of the Atherton Tablelands. It is terribly touristy but very cute, and with so much to see that it was hard to fit into one day. In Kuranda there are rainforest markets filled with hand crafted goods and aboriginal artefacts, boutique restaurants and cafes with gorgeous views of the forest life that surrounds. Also, there are nature-based attractions such as the bird walk, koala park and bat sanctuary. The place is also surrounded by rivers and waterfalls, including the famous Barron falls which is the supply source of a hydroelectric power station. Expect to spend a lot of money here. Eating and getting into the attractions is expensive but the place is very cute and a great cultural experience. Its a good idea to get here early because the entire town shuts down at around 4:30pm and we missed out on the bat sanctuary because of that. Hostel: We didn’t stay here but there are hostels and you can even sleep in a tent in amongst all the night-animals. Food: There are many great looking places to eat here. 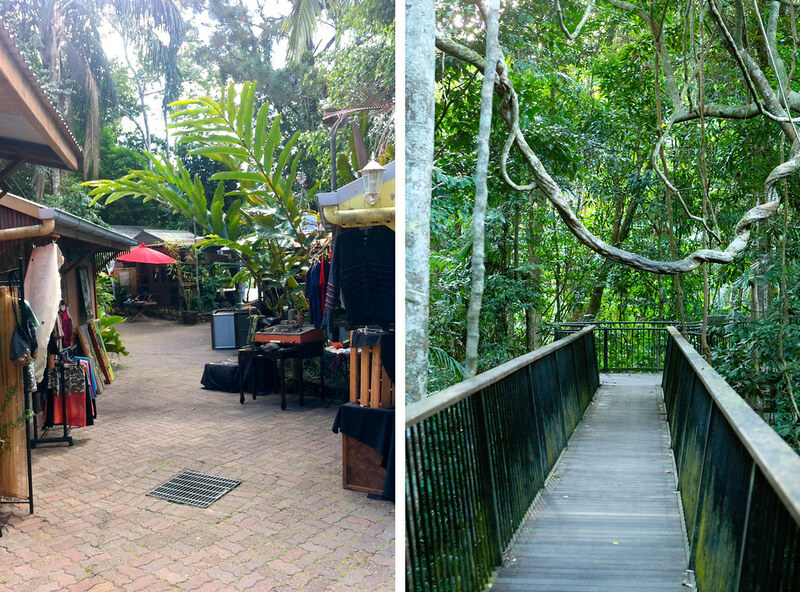 Bars with verandas that overlook a rainforest gully, cafes nestled amongst the trees aside a river and interesting eateries strewn in amongst the market stalls that wind down a rainforest path. We splashed out and ate french crepes at Petit Cafe which was located on a veranda that overlooked all the market stalls. I had a delicious kangaroo prosciutto crepe that cost about $16 (didn’t really fill me up though). Other: There are a variety of things you can splurge your money on not only in Kuranda but also getting there. If you don’t have a car you can do a tree-top skyrail there and/or back from Cairns, or catch the scenic train that stops at Barron Falls and allows you to get out and take photos. You can mix-and match the cable car and train, doing one there and another home. It’s not cheap though, costing around $45 each way. On the other hand we spent $5 on petrol driving there. There are also the wildlife parks: The Venom Zoo, Koala Gardens, Wildlife Safari Reserve, Butterfly Sanctuary, Bird World and Bat Reach. Most of them costing around $20 to enter (except Bat Reach which was only a gold coin donation). Favourite things to do: I could only afford entry to one of the wildlife parks, so I chose BirdWorld because I’m a little bit obsessed with birds. It was great because they were all free-flying and incredibly tame. They would come and land on you at will, hoping you’ll give them some of your treats. There were several macaws that were more than happy to chill on your arm, but we made friends with a noisy sun conure who sat on our heads and chewed on our cameras for the entire walk around the sanctuary. For more photos of the birds see the Photoblog. We also wanted to go to the Bat Reach because the bats are free flying too but we didn’t get there until after it had closed. The markets there are amazing. Instead of the traditional markets with stalls lined in a row, this place has tiny wood shacks built in amongst a winding forest path that runs down the side of a hill. Each shack has a different stall, most of the stalls containing hand crafted goods made by the locals and ranges from paintings, sculptures and leather goods to traditional Arboriginal craft such a didgeridoos. Everything was expensive but beautiful just to walk around and look at.